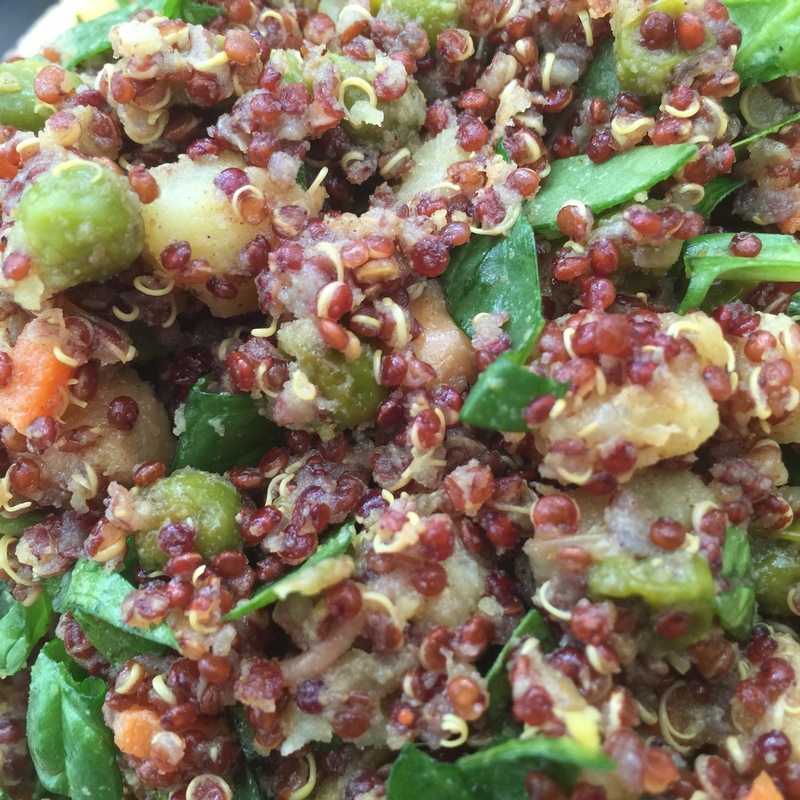 Soak your quinoa in water for 15 minutes. Rinse in a strainer for 2-3 minutes. Bring 1 ¼ cups vegetable stock to a boil, then quickly add quinoa and reduce heat to low. Cover and cook on low for 30 minutes. Add olive oil over medium heat in a large sauté pan. Add the diced onions and chickpeas and continue to cook for approximately 10 minutes. If you see the olive oil is beginning to overheat (that is, splatter), turn the heat down a notch. Add the garlic, ginger, curry, carrot, and peas to the mixture and continue to cook for another 3 minutes. About 10 minutes before the quinoa is done, add the raisins. 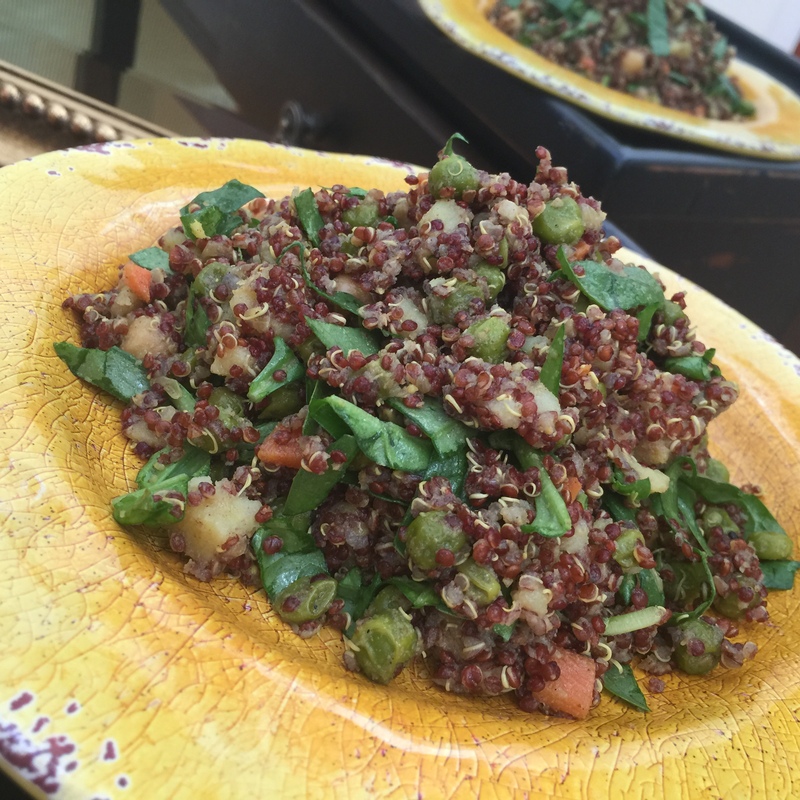 When time is up, remove quinoa from heat and allow it to sit for another 5 minutes. Fluff with a fork and thank us for quinoa perfection later. Add the quinoa to the sauté pan with the chickpea mixture. Add remaining ¾ cup vegetable stock and continue to simmer on low heat for 5-10 minutes until water is absorbed but quinoa is still moist. Add spinach (it will wilt a bit). Add cinnamon, season with salt and pepper, and serve piping hot.